A long time ago, in a galaxy far, far away, lived a beautiful princess. CGI was a phrase unknown to mankind. Hollywood introduced us to computers, giant boxes with blinking Christmas lights, their workings a mystery to everyone except Martians. The moniker ‘C.G.I.’ was a cold and alien concept, had no place in the magical world of film, and most definitely no place for it in the breathtaking world of one Sleeping Beauty. Beauty came into our cinematic lives in 1958. The archetypal story, neither stale nor overplayed—Sleeping Beauty was one of the first times the ‘Pure Princess versus Evil Queen’ battle was so colorfully presented on the big screen. Disney’s lush, mesmerizing color palates and glorious renderings of both characters and scenery move me to this very day. However, there is one character who still, to this day, represents the reason that this former princess pulls the blankets up over her eyes and yelps joyously in terror: the appearance of Maleficent, the Wicked Queen, and her transformation into one of the most wicked dragons the silver screen has ever seen. A transformation, I must add, that was done without CGI, without a team of walking computers, hardware, software, firewalls and megabytes. That being said, Sleeping Beauty now carries the honour of being the first Disney Classic to be released in Blu-ray format. Add that to the new 5.1 Disney Enhanced Home Theater Mix (DEHT) and, well, it is very difficult to be a complete technophobe. Breaking it down to layman’s terms: it looks and sounds so akin to divine that one must wonder what one did in a past life to be rewarded with such heavenly treats. And to say that this is a children’s film or even a film speaking to the child in all of us would be to simplify a Disney film that goes far beyond such a statement. It is, in my humble opinion, the darkest film to burst forth from the creative pens at Disney Studios. There is a lingering, permeating, atmosphere of sinister gloom from beginning to end. Even in the opening frames one knows what terror lies in wait for Princess Aurora. Even more specifically, more artfully, Aurora’s loved ones carry both in their gate and facial expression an weighty foreboding, that which they try to brush away but cannot deny. Even the tune Aurora sings while frolicking among the woodland creatures is haunting, siren-like, and angst-ridden. Even black magic’s symbolism is eerily present. One easily seen example appears when the Evil Queen shows up at the palace and curses the palace’s knitting wheels. Whilst her evil laughter still darkly hangs in the air, she disappears in an ominous cloud of smoke. As her image wanes, it shrinks to the blackened shape of a ram’s or goat’s head, an image long affiliated with the dark arts. Ironically, the film is color-saturated, even more evidently so with the new transfer. I have never seen Sleeping Beauty so flawless, breath-taking, awe-inspiring… I literally watched with my jaw agape. I’m sorry, but try as you may, no one will ever produce such a reaction with CGI-animation. Don’t get me wrong; I am not from any decade wherein ‘days of yore’ might be appropriate. CGI is fine to enhance live-action films… but carrying the whole film? No more so than Astroturf is acceptable in Yankee Stadium, faux-hawks are a sign of socio-political revolution, or Pete Townsend and Roger Daltrey should tour as The Who. Sometimes the Old Original is, really, irreplaceable. In all my years of being an Old School (hand-drawn, please) Disney fan I have never forgotten the first time I saw Sleeping Beauty. It was an old theater, used primarily for formerly ‘black-light’ bands/concerts. But old red velvet curtains still parted to reveal that movie screen… Sadly, the Tower Theater no longer sponsors Saturday matinees for the wee folk. If you ever do get the chance to see SB on the big screen—more specifically, at one of the grande dame-era theaters—bustle up the kids (oh hell, just go alone), grab a center-aisle seat, and be prepared for a movie experience Hollywood, Disney, no one can reproduce these days. Princess Fun Facts, also known as the “Enhanced Home Theater Mix,” will round out Princess Aurora’s world even moreso by revealing interesting facts and trivia about both Aurora’s royal family and royal families that inhabited the earth centuries ago. Clocking in at just under half an hour is a Pictorial Interpretation of Ferde Grofe’s “Grand Canyon Suite” (photographed in CinemaScope, no less), a mash-up of Wild, Wild Kingdom and a night at the Metropolitan Opera. If you are familiar with the Above series which PBS shows from time to time, it is the best analogy I can give you regarding this unusual extra. Each musical movement focuses on a different geographical slice and meteorological phase of the Grand Canyon annual cycle. This Oscar®-winning short opened for Sleeping Beauty theatrically. In perhaps the oddest extra, The Peter Tchaikovsky Story (told in two versions)—first aired on January 30, 1959—“…marked the first widescreen presentation and the first stereo simulcast on TV. Disney went to truly remarkable lengths to flesh out this DVD set, to offer, literally, something for everyone. Hosted by Walt Disney himself, this is a must for all of you closet A/V geeks out there. It was literally the first time a TV programme was aired not only in widescreen—but also in “stereophonic sound (that is, if you had an AM and FM stereo set up nearby). It is truly wild, to see that moment when it all came together. There are two versions of this extra, both clocking in at approximately 49 minutes. “Picture Perfect: The Making of Sleeping Beauty”: Maps the mind-boggling journey of the creation of what is arguably Disney’s crowning jewel, which took most of the 1950’s to bring to life. An outstanding 43-minute documentary. “Eyvind Earle: The Man and His Art”: A mini-biography of one of Disney’s most revered animation artists. “Sequence 8”: The story of why Prince Philip and Princess Aurora’s woodland dance scene took so long—and so much—to complete. Alternate Opening: Told through narration, character voices, and original drawings/storyboards. Deleted Songs: Three songs—“It Happens I Have A Picture,” “Riddle Diddle,” and “Go To Sleep”—didn’t make the final cut into the film. Disney is presenting them here via rare recordings, in some cases even more than one version. Storyboard Sequences instead of the normally stagnant presentation of the film’s storyboards, they are here presented in a split screen—the illustrations in the top half of the screen, the scene from the film in the bottom half. Live Action Reference: Wonderful extra, showing the Disney artists rendering the live action models for reference when they will animate the characters of Sleeping Beauty. 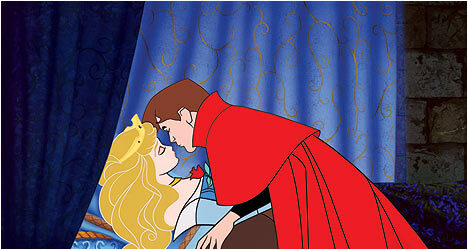 Sleeping Beauty Art Galleries: Eight different art galleries featuring eight difference facets of the film. Original Disneyland Sleeping Beauty Castle Walkthrough Attraction: Both the ‘Auto’ and the ‘Walkthrough’ tours are shown, including the history or the Sleeping Beauty Castle Walkthrough Attraction. Publicity: Includes three movie trailers. Four Artists Paint One Tree: Walt Disney gives an art lesson.